Renowned for its beaches, places of worship and world heritage architecture, Goa,located in the Western Ghats range, has rich flora and fauna because of this range and has been classified as a biodiversity hotspot. The capital is Panaji and Vasco de Gama is the largest city. The Indian epic Mahabharata refers to the area now known as Goa, as Goparashtra or Govarashtra, which means a nation of cowherds, which is visited by large numbers of international and domestic tourists each year. Welcome on board the Goa Holiday Package! Goa's wildlife sanctuaries boast of species of plants, birds, animals and a genera of reptiles,fox, wild boars and migrating birds are found in its jungles! The avifauna include kingfishers, mynas, parrots, crabs,lobsters, shrimps, jellyfish, oysters and catfish, forming some of the piscine catch, from the rivers. Tourists must visit the famous National Parks, including the renowned Salim Ali Bird Sanctuary, and other wildlife sanctuaries such as the Bondla Wildlife Sanctuary, Molem Wildlife Sanctuary, Cotigao Wildlife Sanctuary, Madei Wildlife Sanctuary, Netravali Wildlife Sanctuary and Mahaveer Wildlife Sanctuary. Goa has two World Heritage Sites to enamour the tourists, the Bom Jesus Basilica and Churches and Convents of Old Goa. It also has the Sanctuary of Blessed Joseph Vaz in Sancoale, and the Pilar Monastery which holds novenas of Venerable Padre Agnelo Gustavo de Souza in November every year. There are a number of Churches (Igorzo), like the Baroque styled Nixkollounk Gorb-Sombhov Saibinnich in Panjim, the Gothic styled Mater Dei, Mother of God Church in Saligao and each church has its own style and heritage with architectural wonder, besides the splendour of the Kopelam and Irmidi Chapels. There are many enigmatic forts to visit in Goa such as Tiracol,Chapora, Corjuem,Resi Magos, Nanus, Mormugao,Fort Gasper Dias and Cabo de Rama. A historic, adventurous, and musical celebration on the Goa Holiday Package would take the tourists towards several parts of Goa, where mansions have been constructed in the Indo-Portuguese style structures, amply prevalent, and the Fontainhas in Panaji, which has been declared a cultural quarter, showcasing Konkanese lifestyle and architecture. Some influences from the Portuguese era are visible in Goa's temples, notably the Durga Temple, the Mangueshi Temple and the Mahalasa Temple, most of these reconstructed in the indigenous Indian style. Goa also has a few museums, the two important ones being Goa State Museum and the Naval Aviation Museum, which is one among three of its kind in India, the other two being in Delhi and Bengaluru. The Goa Science Centre, located in Panjim and The National Institute of Oceanography, at Dona, are important landmarks for a visit! Though it has a few rivers, the Mandovi river is the most popular with its steamer cruise offers, including a treat of Konkan folk dance and music on board with tourists joining the revelry,inclusive of the option of having drinks and dinner on board. The local ferries are very popular, where travellers can cross the river to-and-fro free of cost, though these may be jampacked with cars, motorcycles, fisherwomen, flower-sellers and people on their way to work. In the area of Western music there are several pop stars, amongst them Remo Fernandes, having achieved recognition around the globe. Goan popular music is generally sung in the Konkani language. Another contributor to Goan music is the Canadian-Goan band, Goa Amigos, which has represented Goa at the largest south Asian festival in North America. The beach state has become a home for electronic music,especially a style called Goa trance. There is a wide variety of attractive Goan handicrafts to tempt the visitors to purchase souvenirs, from coconut shell carvings, silver jewellery, jute macramé, crochet, embroidery, mats made of banana, coconut, pineapple fibre to the famous Goan lace,crochet. Not to be left behind is the fine variety of wines, feni, plentiful fish food, aromatic spices and raw cashewnuts. Goa also boasts of several sumptuous bakeries which began over a century ago, which make some of the best pastries, cakes and sandwiches, in the country, catering to the sweet and savoury palate! 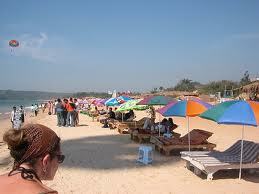 Ease your pockets to indulge yourselves on the Goa Holiday Package! Rice is the main food crop with pulses and ragi and the main cash crops are coconuts, cashewnuts, sugarcane, besides fruits like pineapples, mangoes and bananas. The Hindu food of Goa is the unique Konkani vegetarian menu with exotic dishes like signature dali-thoy, varieties of ghashi, ambaat, sukke, saaru-upkari, kolombo, pathrado, patholi, paayasu, ubbatti, only few of which have been silently adapted in the vegetarian spread of Gujarat, Maharashtra, Karnataka and Kerala, served in this state.The other cuisine is mostly seafood -based with the rich staple food being fish. Kingfish (Vison or Visvan) is the common delicacy, while other popular fish include pomfret, shark, tuna and mackerel.Among the shellfish are crabs, prawns, tiger prawns, lobster, squid and mussels. The food of the Goan Christians is influenced by the Portuguese! Goa features a tropical monsoon climate, and being in the tropical zone and near the Arabian Sea,has a hot and humid climate for most of the year. The month of May is the hottest, coupled with high humidity. The monsoon rains arrive by early June and provide a much- needed respite from the heat, lasting till late September. Goa has a short winter season between mid-December and February, with moderate humidity and further inland, due to altitudinal gradation, the nights are a few degrees cooler, when tourists flock to the fun and fiesta of the Goa Carnival! A destination for all seasons, that is, the Goa Holiday Package!